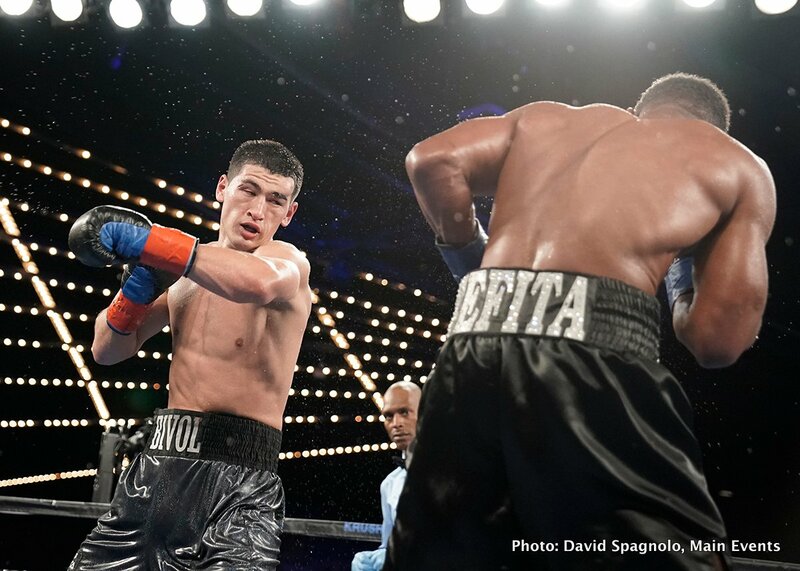 Just four years after making his professional debut, WBA Light Heavyweight World Champion Dmitry Bivol (13-0, 11 KOs) of Russia finds himself with a problem unique to formidable champions: finding worthy opponents willing to go up against him. Fortunately, light heavyweight contender Isaac “Golden Boy” Chilemba (25-5-2, 10 KOs) of Malawi stepped up to the challenge. Bivol and Chilemba will fight in the co-main event on the Sergey “Krusher” Kovalev vs. Eleider “Storm” Alvarez card at the Hard Rock Hotel & Casino Atlantic City on Saturday, August 4. The doubleheader will be televised live on HBO World Championship Boxing beginning at 10:00 p.m. ET/PT. “I respect him,” said Bivol of Chilemba. “He took this fight. He fought against the big guys in the division like Kovalev and Alvarez. Both times he fought all 12 rounds. He has good experience. I think he’s stronger than he was one year ago. Sometimes this (a loss) makes you better,” said Bivol. Bivol’s manager, Vadim Kornilov, says Bivol was already a complete fighter when he turned professional after an accomplished amateur career. “The last ten fights have given him the confidence to face any of the top fighters. I think a lot of the others are already not interested in fighting him, not as interested as they are showing. It’s the problem every top world fighter has. Nevertheless, Kornilov is confident Bivol’s promoters, World of Boxing and Main Events, can make the big fights happen, even if potential opponents and their promoters are afraid of him. Bivol says his dream is to be an undisputed champion. “I think in the next year, he will take bigger steps toward that goal,” said Kornilov. Bivol says his confidence is growing, but at the same time, his level of responsibility is growing after every fight – especially the motivation to take care of his young family. For the first time, Bivol’s wife and two young children joined him for the first few weeks of training camp in Oxnard, which helped him avoid being homesick while spending several months apart in St. Petersburg, Russia and Oxnard, California. “They are my motivation. They motivate me. I think about why I love them, that’s why I’m working so hard. I work hard to support them, so they will see how I feel,” said Bivol.